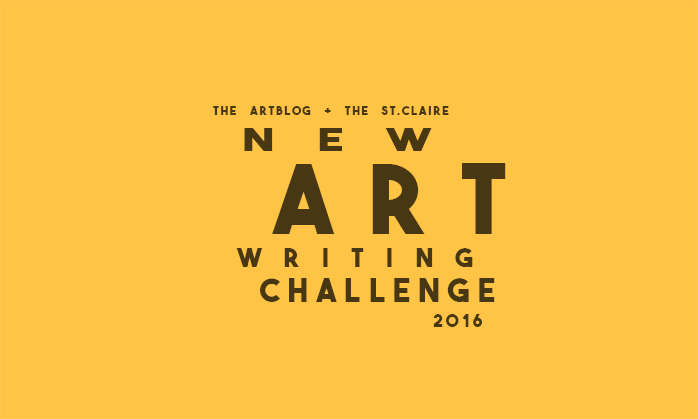 The Artblog and The St.Claire are excited to announce the 2016 New Art Writing Challenge – a FREE region wide contest to find the best new approaches in art writing. The goal of this competition is to get more people writing about art and foster a culture of art writing that incorporates a wide spectrum of methods, styles and ideas. The best writing will not only address the art in question, but also progress the conversation into unexpected and underrepresented territories. Cara Ober founded BmoreArt in 2007 in order to create more visibility and community within the arts in Baltimore. Ober earned an MFA in painting from the Maryland Institute College of Art in 2005 and a MS in Art Education from McDaniel College in 1998. She graduated Phi Beta Kappa from the American University in 1996 with a BA in Fine Arts. Ober was awarded an Individual Artist Grant for Painting by the Maryland State Arts Council and a Warhol Grant for Emerging Curators in 2006. From 2010-2012, Cara was the Online Arts and Culture editor at The Urbanite Magazine and wrote the Eye to Eye Arts Column in each monthly issue. She has published art reviews for Hyperallergic, BurnAway, Art Papers, ARTnews, The Journal of Surface Design, The Baltimore Sun, Baltimore Style Magazine, The Urbanite, Baltimore City Paper, Art US Magazine, and numerous curatorial and catalogue essays. Meredith Sellers is an artist, educator, and writer currently living and working in Philadelphia. She earned her BFA in Painting from the Maryland Institute College of Art in 2010 and received her MFA in Interdisciplinary Fine Arts in 2012 from the University of Pennsylvania. She has published writing on Hyperallergic, ArtsJournal, Daily Serving, Pelican Bomb, Title Magazine, The St. Claire, and the Artblog. She co-curated the exhibition Chewing the Scenery at Icebox Project Space in 2016, and co-organized If You Leave: A Panel Discussion on Artist Retention in Philadelphia as part of the St. Claire’s Home School series of independent seminars in 2013.